Maplehurst Fence Company and Texas Fence Connection have constructed more than 1,000 miles of high tensile wildlife fencing over the last 15 years. Our projects have ranged from very small deer handling facilities in the US to a comprehensive 13,000-acre desert bighorn preservation and breeding complex in the Mexican frontier. Our clients include private land owners, large corporate ranches, commercial deer and exotic animal breeders, horse and cattle ranches, vineyards, industrial facilities and government entities. We also design and construct very complex deer handling facilities. Our primary clients are sportsmen and private land owners, and our primary business is the engineering, design and construction of high tensile Solid Lock® game fencing for private hunting ranches. Utilizing the latest technology and very specialized equipment, we have the experience and personnel to design and construct your facility in the shortest possible time frame. And because of the volume of our work, we are able to purchase materials and supplies at a price level that allows us to pass our savings on to you. We have ongoing projects with many of our larger corporate ranching clients, including Rancho Blanco near Laredo and the Dougherty Ranch near Freer. These clients call us year after year to provide additional or replacement fencing because they know us and they are confident that we will construct top-quality fencing at a reasonable price, within budget and on time. Deer breeders know that we design and construct the most efficient breeding and working facilities available. Our commercial breeder clients in Texas include Mustang Creek Ranch near Salado and the Hi Gate Ranch near Bandera. We also provide low fence solutions for many of our customers. Our long-lasting Solid Lock® cattle and horse fencing is a superior replacement for barbed wire at a very competitive price. We have also constructed 48” and 60” high tensile mesh fencing to exclude dogs and other predators from Dan Moultrie’s quail hunting ranch in Alabama and to keep hunting dogs off a bow hunting ranch in Virginia. 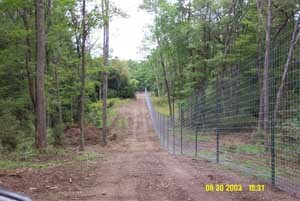 Deer exclusion fencing is a growing part of our business. We constructed the original vineyard fencing for the Palmaz Vineyard in Napa, California and we have a continuing contract to construct additional vineyard fencing every year Biltmore Estate in North Carolina. We also built the perimeter fencing around the 500-acre Cooper Tire test track near Pearsall, Texas, the perimeter deer exclusion fencing for the Troy, Alabama municipal airport and 10 deer exclusion fences in 3 National Forests in Mississippi. Our governmental clients include TVA, the St. Louis Zoo, the City of Troy, Alabama and the State of Mississippi. We are also anticipating a project to construct 14 miles of highway fencing for the State of Florida. Other commercial and industrial projects have included security fencing for Trailer Wheel and Frame in Houston and an apartment complex in Alabama as well as perimeter fencing for a large landfill in Texas. With satisfied customers in 20 states plus Canada and Mexico, Maplehurst Fence Company and Texas Fence Connection should be your logical choice for all your wildlife fencing needs.